Picture the following: decorative mulch neatly piled high around the base of an Autumn Blaze maple. If you are like many people, you may find yourself admiring such tidy landscaping. This pile of mulch is often referred to as a mulch volcano. Believe it or not, it is very harmful to a tree—and bad for shrubs too. Unfortunately, it is prolific in the suburban landscape. The concept is fairly simple. Trees and shrubs have different parts that serve specific purposes, and each part has adapted to certain conditions. To be specific, the roots of a plant are designed to grow in the soil and soak up moisture. The trunk, in contrast, is designed to grow above ground where conditions are dry. But piling mulch around the base of a tree or woody shrub keeps the trunk moist, thereby suffocating cells due to water saturation. This harms the cells of the trunk. As the cells become damaged, they are not able to perform their duties, which includes gas exchange and moving food through the plant, just to name a few. Furthermore, a mulch volcano provides an opportunity for the tree’s roots to grow around the trunk. As the roots elongate over the years inside of the mulch volcano, they encircle the trunk. This is called girdling. The girdling action literally strangles the tree and deprives the roots and canopy of necessary resources. But the story gets worse. As the tree declines in health, it becomes more susceptible to attack from pests, diseases, and harmful fungi. To give an analogy, a human with a weak immune system is more vulnerable to catching colds, the flu, and other sicknesses. Similarly, a tree with these underlying health issues is more susceptible to “sicknesses” from pests, disease, and harmful fungi. – Install the mulch around the tree to a depth of 2 to 4 inches. – Extend the mulch to the outer edge of the tree’s canopy if possible. 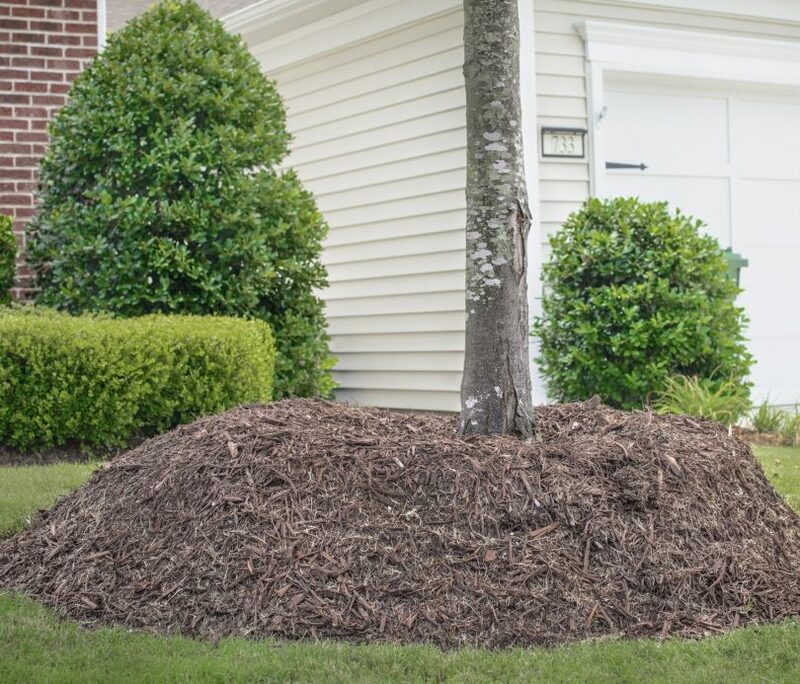 – Make sure there is no mulch within 3 to 6 inches of the base of the tree. – All of this applies for shrubs as well. Proper mulching provides outstanding health benefits to trees and shrubs, such as helping retain soil moisture, regulating soil temperatures, and improving soil conditions. The list goes on. For a tree with a long-standing mulch volcano and existing girdling roots, the remedy is more complex. You must use an air tool to remove the mulch volcano. The air tool will move the dirt without harming the roots. Then you must carefully prune girdling and otherwise threatening roots. This is a complex task that requires expertise and may require several years of calculated pruning decisions. Without proper training, it is best to avoid this task yourself. Otherwise you may kill the plant. The objective is to imitate what occurs in nature. When walking through the woods, you will not see a tree or shrub with a buried root collar. Instead, each tree will have a visible root flair that spreads gently into the surrounding grade. In a perfect world, all our suburban trees will have this visible root flair at the base of the trunk. Featured image by Basil Camu.